Visit our London showroom to have information about our products and discover all our wine cabinet ranges and storage solutions. Our specialists will advise you to help you find the right solution. The browser you are using does not support iframes or is has been disabled, to view the map click here – view map. The information requested on this form is only intended for EuroCave and its partners. 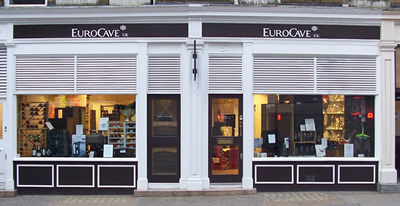 The data is securely stored in a EuroCave database. It enables us to offer you customized services and information about our products and services. In this way, they are used for purposes of customer loyalty, management and statistical analysis. In accordance with the Data Protection Act, you have the right to access, modify, object to, rectify and delete data about yourself. To exercise this right, please fill this form, or send us an email, or write to EuroCave - 57 Chiltern Street, London, W1U 6ND. or any technical assistance to access the catalogue, please click here.